It is impossible to create harmonious interior without properly chosen lighting that would correspond to the specifics, the focus and the overall design of the room. Kitchen and dining areas are special places in the house; here we prepare food or welcome guests, and sometimes, when we are alone, enjoy the silence with a cup of tea or coffee. The optimal solution for those areas should be rich and layered lighting that will help to create the right conditions for comfortable work and for easy relaxation. Using different lighting, you can not only create a cozy atmosphere, emphasize strengths and hide weaknesses, but also to decorate the space in an original way. To best accommodate lights in the places where they are really needed, it is better not to put this issue on the back burner. Once decided with the style, overall design and placement of the furniture in the kitchen – proceed to the planning of kitchen lighting. After finishing painting the walls and installing the furniture, placement of fixtures on the walls or inside the kitchen set can be problematic because of the need to create new channels for wiring, so it is better to plan ahead all the possible options. Upgrading the lighting in the old kitchen is easier by installing new ceiling lights, or adding original table/floor lamps. For a more radical upgrade it is better to refer to specialists. In the kitchen, it is advisable to combine general light that illuminates the entire room (ceiling lamp, chandelier), with local working area or decorative lights (sconces, fitted spotlights in the area of ​​cooking). Priorities in terms of organization of lighting are in two main areas – working and dining, others may remain in the shadows. Overall light cannot be seen as a complete replacement for lighting of working and dining space. Of great importance are the illumination power and the color of the light. In the kitchen, the most appropriate lighting is in the natural spectrum that does not distort the color of the products. Illumination power depends on the kind of atmosphere that you would like to create in the kitchen. By using dimmers, you can smoothly adjust the intensity of illumination. Moreover, spotlights that are built into the top of the cabinets can make the kitchen more spacious and visually “raise” the ceiling. Traditional kitchen lighting scheme with a single lamp in the center of the ceiling is hardly to be called complete. To ensure uniform lighting, it is recommended to use multiple ceiling lights. For general lighting it is better to avoid using lamps that have their light directed exclusively vertically downwards since they illuminate a small space and create shadows. 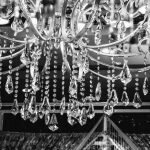 If the local and decorative lighting are properly organized, then the central chandelier can be even completely left out from the design. This is true for both small and large kitchen spaces. Ideally, in each functional area separate lighting scheme should be organized.